Since there are no manufacturer’s coupons needed for this deal, you can use up to 4 Register Rewards to pay for it. *I’m not including the OR deposit in the final analysis since you get the $4.80 back when you return the bottles. I had no problem doing this – glad to learn about limits. I'm pretty sure if you hand it over after the clerk hits subtotal they won't even look at it (because I don't think it will beep). 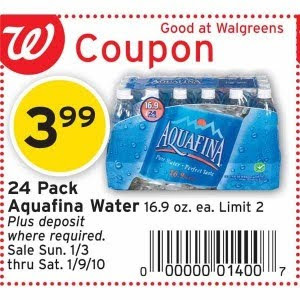 Good question — the register does not recognize limits on Walgreens coupons, so you will get the $2 discount on as many as you buy. Your cashier may enforce the limit though. How does this work when the coupon says limit 2?